We are a world of comparisons. And when it comes to understanding the implications something has on our health, what better way to drill it through people’s heads than to compare it to something that has, for decades, been shown to significantly harm health and even cause death? I am referring to sugar, which many are now referring to as ‘the new tobacco.’ Our overconsumption of this sweet substance has created a health crisis that only stands to worsen unless we change our ways. Sugar consumption has skyrocketed by 30% in the last 30 years, with the average American adult consuming 22 teaspoons of it daily. And children are faring even worse, consuming a whopping 32 teaspoons every day. To put that into perspective, the WHO recommends just six teaspoons daily. The soda industry, much like the tobacco industry, profits by selling products that are known to be both unhealthy and directly correlated to many diseases. But, unlike tobacco, soda consumption is still considered to be acceptable in moderation. Yet plenty of research has shown that refined sugar is biologically additive, and many would argue that in the coming years, it will become clear that soda should be avoided altogether. To think that the simple pleasure of picking up a can of soda and slurping it down on a regular basis is an addiction seems extreme, but that is the reality for many people. So how exactly did so many of us become dependent on getting our soda fix? We know that soda isn’t water. But when we drink it, we often fail to realize just how much sugar, and calories, we’re ingesting. We’ve been well-informed in recent years just how bad sugar is, even warned to stay away from it at all costs, as it can lead to weight gain, diabetes, heart disease, and teeth and bone damage. “People who drink this ‘liquid candy’ do not feel as full as if they had eaten the same calories from solid food and do not compensate by eating less,” explains Harvard researchers. And if you’re looking to lose weight, it seems a no brainer to take sugar out of your diet. “I know of no other category of food whose elimination can produce weight loss in such a short period of time,” notes Dr. David Ludwig, the director of the New Balance Foundation Obesity Prevention Center at Boston Children’s Hospital. Yet, we drink, and we drink, and we drink. Is it because we like it, or because we just can’t stop? 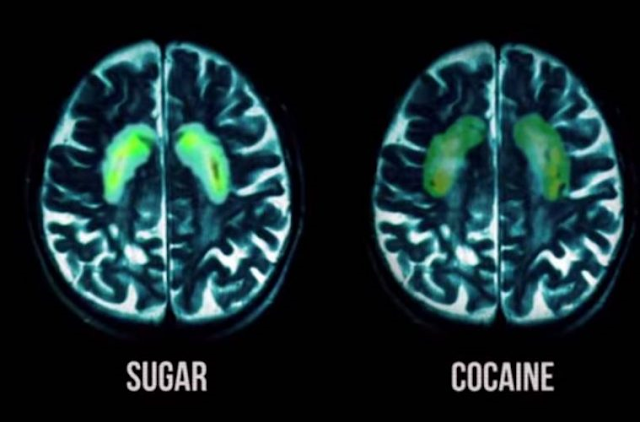 Sugar has been shown to have similar effects on the brain as drugs like cocaine have. And to think Coca-Cola used to be made with cocaine just puts the cherry right on top of the sugary mound of madness. And it was recently revealed by the University of California San Francisco that the sugar industry distorted research on the causes of heart disease. Research had previously shown in the 1950s that sugar was connected to heart disease, but then the Sugar Research Foundation sponsored a 1965 Harvard University literature review that devalued the risks of sugar, even pointing the blame on fats. Even more concerning is the fact that the federal government didn’t even publish recommendations regarding sugar consumption until this year. The soda industry also pays health professionals to put out statements that support them. For instance, Kyle Pfister, a public health advocator, found that dietitians were actually tweeting against soda taxes, revealing the dirty truth of their connection to the soda industry in the process. Furthermore, a study from the American Journal of Preventive Medicine revealed that Big Soda giants Coca-Cola and PepsiCo financially backed around 100 health organizations from 2011 to 2015, including the American Diabetes Association and the American Society for Nutrition. Soda companies have, without us really knowing or acknowledging it, slipped into the health and wellness industry. So much so that, just last year in November 2015, Rhona Applebaum, Coca-Cola’s chief scientist and health officer, was forced to resign after leaked emails between Applebaum and University of Colorado professor James O. Hill revealed the incredible bias of the Global Energy Balance Network’s health recommendations. Another way the soda industry has reeled us in is by overselling their environmental image, or “greenwashing.” They do this by outright boasting their support for the environment, safe water supply, exercise, and more. For instance, both Coke and Pepsi promote “plant bottles” that are made partially from plant materials. However, critics warn that the ads behind these plant bottles are entirely misleading, because, though the bottles may be made partially from renewable sources, once they are manufactured, they are still plastic, and therefore have the same harmful attributes as those made from petroleum. There’s also the concern of soda companies promoting their plant-based technology, which may confuse people into thinking their products are biodegradable, and not recycling them. And as for water concerns, Coca-Cola tricked people into believing their water replenishment campaigns are worthy of celebrating, even boasting that they replenished all of the water they used in 2015. However, the water they saved only accounts for what goes directly into the product, not the 150 billion gallons used for manufacturing plants, or even growing their sugar cane. All of this information feels eerily similar to brainwashing. Are we being tricked into addiction? Into diseases? Into, ultimately, death? False claims, manipulative advertisements, and corruption within the government and food industry all reveal the very tangible reality that getting you hooked, and keeping you hooked, may very well be on someone’s agenda.